1. He was born in August 1845 in Boulogne-Sur-Seine, the youngest son of James Jacob Rothschild, a French member of the Rothschild banking family. 2. His interests were not financial, but artistic and scientific. He founded institutions for scientific research in France, Spain and England, and sponsored archeological digs in Egypt, Syria and Palestine. A prodigious collector of art, he was to bequeath to the Louvre more than 40,000 engravings, almost 3000 drawings and 500 illustrated books. The gift included more than 100 drawings and engravings by Rembrandt. And this was only a part of his collection! 3. In the wake of the Russian pogroms of 1881-2, he began cutting back on his purchases of art and buying up land from Ottoman landlords in Palestine, instead. 4. It is estimated that he spent over $50 million supporting Jewish settlements in Palestine. He was the patron of Rishon LeZion, the first of the new settlements. Between 1883-9 he subsidized it, as well as Zikhron Yaakov, Rosh Pinna and Ekron, and over the years donated significant funds to other settlements, as well. Between 1900 and 1918, the number of Zionist colonies grew from 19 to 47, largely with his funding. 5. He promoted economic development, notably through wineries at Rishon LeZion and Zikhron Yaakov. In addition, he supported research in electricity and financed an electric generating station in Palestine. 6. Because of his involvement in so many young settlements, he became known as the Father of the Yishuv. And because of his wish to remain anonymous, in the background, he was called HaNadiv HaYadu’a, the Known Benefactor. 7. One thing he was known for was encouraging settlement by pious, Hebrew-speaking, agricultural immigrants. 9. At his death in 1934, he left a legacy which included nearly 500,000 dunams of land in what is now Israel, and nearly 30 settlements. 10. His will included a request to be buried in the Land of Israel. Originally interred in Paris, his remains and those of his wife were transported to Israel in 1954 and laid to rest in Ramat HaNadiv Memorial Gardens. In his memory, his son provided funds for the construction of the Knesset. 1. He was born in the Crimea in 1876. 2. He earned a Ph.D. at the University of Bern in Switzerland, then returned to Russia, where he taught in Hebrew schools. 3. An early Zionist, he was a delegate to the Sixth Zionist Congress held in Basle in 1903, where he opposed the British plan for using Uganda as a Jewish homeland. 4. Not long afterward, he made aliyah to Palestine, where he helped establish Gymnasia Herzliya, the first Hebrew high school in Eretz Yisrael. He was one of its first teachers, even before the establishment of Tel Aviv; later, he was its principal, and he continued to teach geology and geography there until 1951. 5. At the school, boys and girls attended classes together. Classes were conducted in Hebrew, and the bible was taught as a literary text, bareheaded. School trips were a part of the curriculum. 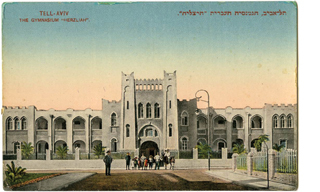 As Tel Aviv developed around it, the school became a cultural and intellectual center. 6. In 1921, under the new British mandate that was established after the First World War, Bograshov was elected to serve as a representative to the Tel Aviv City Council and the Assembly of Representatives, the parliamentary body of the Jewish community. He served in these capacities until 1930. 7. Following the Arab riots of 1921, he established the Nordia district in Tel Aviv for Jews who had been left homeless. Bograshov Street, the main thoroughfare crossing the Nordia district, was named for him while he was still alive. His response? He changed his name to Haim Boger! 8. One of the leaders of the Union of General Zionists, he was elected to the Knesset in 1951. Originally centrist, the General Zionists moved toward the right in opposition to the labor movement. Though the party did well that year, winning 20 seats, the success did not last. He lost his seat in 1955. 9. He died in 1963. 10. Here’s the kind of teacher he was: A young man named Alexander Eig was an incorrigible student who wouldn’t go to school, preferring to be outdoors. Eventually, he became a gardener and worked for Chaim Bograshov, among others. It was Bograshov who persuaded him to enroll in the gymnasium. 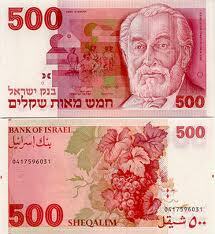 Eig later became Director of Botany at Hebrew University and the man who initiated its botanical gardens. If you’d like to see a lesson plan written in Bograshov’s hand, go to http://www.liveauctioneers.com/item/2582666. 1. He was born in Liverpool in November 1870 and raised in London in an Orthodox Jewish home. 2. The son of a prosperous banker, he was educated at Balliol College, Oxford. 3. In 1902, he became a member of Parliament and in 1909 was appointed a cabinet minister, the first unconverted Jew to serve in such a role. He was not an observant Jew, but neither did he spurn his religion. 4. World War broke out. Britain declared war on the Ottoman Empire in November 1914. Two months later, Samuel circulated to the cabinet a memo on “The Future of Palestine;” in it, he suggested that Palestine, then under Ottoman rule, become a home for the Jewish people. He also put forth the idea of establishing a British protectorate. 5. In 1920, before the League of Nations had even approved the British Mandate, Samuel was appointed High Commissioner of Palestine and continued to serve in that capacity until 1925 – thus becoming, as he said, the first Jew in 2000 years to govern the Land of Israel. 6. He recognized Hebrew as one of the three official languages of the land. 7. He tried to support Jewish immigration while at the same time mollifying Arab objections – a policy that ultimately won him the praise of neither Zionists nor Arabists. Even today, what he saw as an even-handed policy continues to be a bone of contention. Generally, it has been argued that his policies slowed the pace of immigration, but a book published in 1999 takes the Palestinian view, arguing that his policies paved the way for the establishment of the State of Israel. 8. Upon his return to Britain, he remained active and powerful in politics. In 1938, he supported the Kindertransport movement to bring Jewish refugee children from Europe by appealing for homes to take them in. 9. In 1939 he was granted the title Viscount Samuel and later became leader of the Liberal Party in the House of Lords. 10. He died in February 1963.